Our basic subsonic utility flare typically operates at a pressure of less than 0.7 barg. 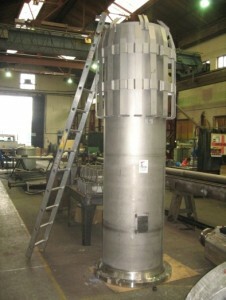 This type of flare is the work horse of the flare industry and is found in most locations where flaring occurs. They are relatively easy to manufacture and provide a good reliable method of low pressure gas disposal whether by venting or flaring. Our pipe flare provides the operators with a simple, robust and reliable flare tip that will typically exhibit long life time. We can supply new bespoke flare tips or refurbishments of other OEM flares to suit the operator’s specific platform or site conditions. The standard flare tip is fabricated in heat resistant 316L SS, 310S stainless steel or 800H materials. Upgrades to higher heat resistant materials are also available when the operating conditions are more onerous than normal. The main body consists of a single pipe, wind deflectors, and flame stabilisers. A purge reduction seal is also included just above the main gas inlet flange and presents a physical barrier to back-flow of air at the inner tip wall. In addition, the seal maximises the velocity of the purge gas in the open centre of the riser, further reducing the risk of air ingress into the flare stack. The key thing is to ensure that the flare tip remains ignited at all times at both low and high flow rates in high cross winds. Good flame stabiliser design using either angled lugs situated around periphery of the tip exit or a concentric type insert coupled with efficient pilots will achieve this across all operating and atmospheric conditions. * Purge rates are typical for fuel gas with a 60% diode type purge reduction seal. ** Purge rates are typical for nitrogen with a 60% diode type purge reduction seal. *** Typical capacity at 0.5 Mach with a molecular weight of 25 kg/kgmol and an operating temperature of 30ºC.